Our readers nominated their favorite subscription boxes, then voted on which of those boxes they loved most. Here’s what they chose as the Best Geek Subscription Boxes! Which subscription boxes are fangirls and fanboys geeking out over? Our readers voted, and these 19 boxes topped the list! Whether you’re a fan of comic book heroes from DC and Marvel, cartoons, video games, movies, anime and manga, or pop culture characters, these subscriptions will keep you well-stocked with merch, t-shirts, collectibles, figures, and more. 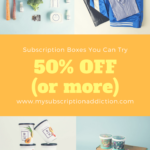 There are a few well-known companies that tend to dominate this category overall, but there are some truly great niche boxes here for specific fandoms and hard-to-find items featured here, too. Update: FYI Loot Crate has been having shipping issues. Check out their shipping status page before ordering so you know what to expect. The Cost: $19.99 plus $5 shipping a month. Sign up here! The Products: Topping the list, it’s Loot Crate! Each month, you’ll unbox 4+ items featuring your favorite franchises from TV, comics, movies, video games, and beyond. (Think things like Rick and Morty, Stranger Things, Sonic the Hedgehog, Harry Potter, Westworld, and many, many more.) Expect a monthly graphic tee, collectibles, gear, figures, and other goodies inspired by a monthly theme! Check out all of our Loot Crate reviews to learn more. The Cost: $39.99 every other month + $5.00 shipping. Sign up here! The Products: This bi-monthly subscription box features 5-7 exclusive, licensed collectibles inspired by Harry Potter, Hogwarts, and beyond. You even get to pick your house when you sign up, to receive customized picks just for you! Check out all of our J.K. Rowling’s Wizarding World of Harry Potter reviews to learn more. The Cost: $13.95 a month. The Nerdy Tees subscription is $15.95 a month. US shipping is $6.00. Sign up here! The Products: If you love quotes, you’ll swoon for Nerdy Post! Each order includes exclusive, artist-created prints and small gift items centered around a popular fandom from books, movies, comics, or TV. Their specialty is lettering and illustration—expect tons of inspiring quotes, whether they come from your favorite Disney characters or the lines of a Stephen King novel! Check out all of our Nerdy Post reviews to learn more. Ships to: US for $6.00. International shipping rates vary. The Cost: Subscriptions start at £19.99 ($28.63 at the current exchange rate) + shipping. Sign up here! The Products: Get 5-10 items, such as t-shirts, toys, and collectibles, all centered around a monthly theme! We’ve seen Marvel and DC goodies, Star Wars merch, and gaming swag, too! Ships to: £2.99 per month to the UK. International shipping £5.99 per month. The Products: World of Wizardry is a Geek Gear subscription made specifically for Harry Potter fans! Each month brings a variety of magical merchandise inspired by Harry Potter and Fantastic Beasts. Check out all of our Geek Gear World of Wizardry reviews to learn more. The Cost: $43.95 + $6 US Shipping. Sign up here! The Products: Squeeeee! This box is the cutest!!! Each seasonal box includes a selection of official Pusheen clothing, accessories, electronics, toys, stationery and more. Check out all of our Pusheen Box reviews to learn more. The Cost: $39.99 + $7 S/H. Sign up here! The Products: Curated by the merch masterminds at Loot Crate, this Firefly-focused subscription box includes 5-7 exclusive collectibles, including figures, accessories, wearables, and more, with a value of $65+! Check out all of our Firefly Cargo Crate reviews to learn more. The Cost: $23.90 a month + shipping. Now shipping quarterly $57 + $8 shipping. Sign up here! FYI – In May 2018, Geek Fuel began shipping quarterly and is now called Geek Fuel EXP. The quarterly subscription is $57 + $8 shipping per box. COUPON: $3 off your first month + bonus items with longer length subscriptions. No coupon required—just use this link! The Products: Geek Fuel EXP is a quarterly subscription box filled with tees, hoodies, comics, and goodies – they promised $100 in value for every box + a Steam game Check out all of our Geek Fuel reviews to learn more. The Cost: $19.99 + shipping. Sign up here! The Products: This subscription box includes geeky goodies from movies, comics, anime, and beyond. We’re talking tees, toys, housewares, collectibles, and much much more! Check out all of our My Geek Box reviews to learn more. The Cost: $19 per month + $3.75 US shipping. Sign up here! The Products: These accessories are just for geeks! Get a monthly set of 4-7 pieces of jewelry or collectibles inspired by a fandom from movies, TV, gaming, and more. Check out all of our Kal-Elle Fandom Monthly reviews to learn more. Good to know: Kal-Elle Fandom Monthly recently opened a shop page where you can purchase any extra past boxes! Ships to: US ($3.75 shipping), Canada ($11 shipping), and the rest of the world ($14.25 shipping). The Cost: $30.00 a month + shipping. Sign up here! The Products: This box is a murder mystery game delivered in monthly installments! Use each box’s clues to solve a series of crimes. Each storyline lasts for 6 months, so something exciting is always around the corner. Check out all of our Hunt a Killer reviews to learn more. The Cost: $26.95 per month + $5 U.S. shipping. Discounts on longer subscriptions. Sign up here! The Products: Anime fans will dig the exclusives inside this box! Think super-cool tees, special edition manga, awesome figures, and more. Check out all of our Loot Anime reviews to learn more. The Cost: $29.99 w/ free shipping (Boxes ship every other month). Sign up here! The Products: Each box includes exclusive collectible product created by Marvel and Funko including apparel, collectibles, and accessories. Boxes have a $50 value! Check out all of our Marvel Collector Corps reviews to learn more. The Cost: $44.99 + shipping ($14.18 to the US). Sign up here! The Products: This subscription features 4-6 high-quality geek and gamer items and no filler or promo items of any kind. You’ll get full-figure statues and small vinyl figures. Themes are anime, gamer, and major franchise focused, and ideal for your monthly geek and gamer fix. Check out all of our Lootaku reviews to learn more. The Cost: $49.99 + $7 S/H. Sign up here! The Products: Throwback alert! This awesome, curated box features a mystery selection of ’90s Nickelodeon-related clothing, accessories, toys, and more. It’s all of your favorite Saturday morning Nick Toons in one super cool box. Check out all of our Nick Box reviews to learn more. The Cost: $28.95 + $5 shipping. Sign up here! COUPON: Use coupon code SAVE3 and save $3 off of your first box or ADDICTION to save 10% off! The Products: Gamers! This is the box for you. Each month, you’ll get 4-6 premium items, including wearables and tons of exclusives all inspired by classic and awesome new games. Check out all of our Loot Gaming reviews to learn more. The Cost: $26.99 + $7.99 S/H. Sign up here! The Products: This fan box is full of limited edition, exclusive, and autographed geeky items with $60+ in value and 1 in 10 boxes contains an autographed item! Plus, every box is guaranteed to have an exclusive or limited edition art print. Check out all of our BAM! Box reviews to learn more. The Cost: $29.99 w/ free shipping (Boxes ship every other month.) Sign up here! The Products: Each box includes exclusive collectible product created by Marvel/Star Wars and Funko including apparel, collectibles, and accessories with a total value of $50! Check out all of our Smuggler’s Bounty reviews to learn more. The Cost: $14.99 a month with free shipping. Sign up here! The Products: Each month, Loot Wearables sends you 1 item of seasonal apparel (like a hoodie, lounge pants, a long-sleeve shirt, etc.) inspired by a super-popular pop culture franchise. Think Rick & Morty, Stranger Things, Firefly, Marvel and DC comics, and more! Check out all of our Loot Wearables reviews to learn more. That wraps up our list of the best geek subscription boxes! Did your favorites make the list? "Very misleading! I tried contacting B.B. and they said kit wasn’t included. Why put it in the email advertising ..."
"I'm picking Maverick just because Top Gun is my life :D"